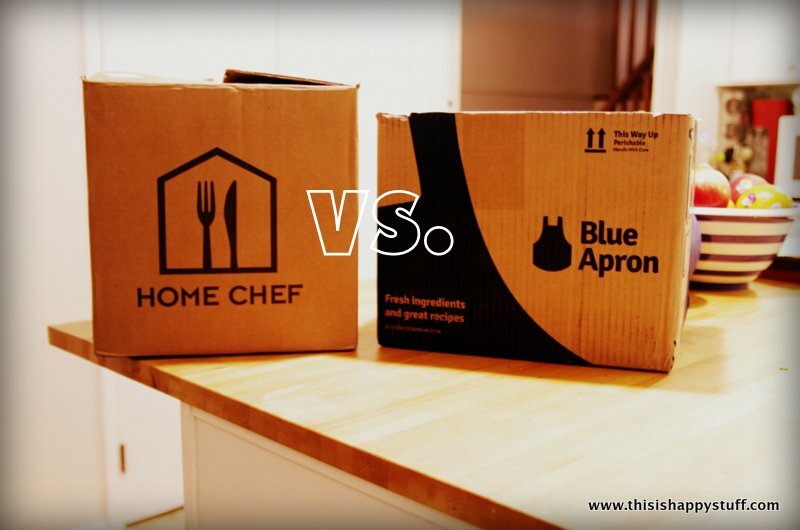 mail-order meals: home chef vs. blue apron | happy stuff. a few months ago, i read a rave review of a mail-order meal service called blue apron (her blog is really hilarious, especially if you like mommy humor) and i was very disappointed when i went to blue apron’s site and discovered that they did not yet deliver to my area. i entered my e-mail address to be notified if they ever did add us in and was excited to get a message from them in late april saying that indeed they could now deliver to us! i had a coupon for some money off, so i thought we’d give it a try. basic premise — blue apron plans 6 menus each week (3 veg, 3 omnivore) for two people and 6 different menus for four people. you sign up for the number of people and state basic food preferences (vegetarian, no fish, etc.) and then they send you all of the ingredients (in just the right portions) and the recipe cards to make three meals each week. you cook the food, but you don’t have to search out recipes or shop for it or fill your fridge with jars of strange ingredients you’ll never use after that one recipe you tried from pinterest (i’m looking at you, trader joe’s soyaki sauce!). you can choose to skip delivery for any weeks you don’t want to have them deliver food and you can stop the subscription anytime you want, no obligations. you can also go onto their website each week before the delivery and choose different menus (for instance, if you don’t like one of the default meat options, you can switch to one of the vegetarian meals instead). we tried blue apron for three weeks. i wish i had some pictures to show you, but weeknight dinnertimes are rough around here and i’m doing great to get food on the table before the kids’ bedtime and taking a photo is one more step i just didn’t do. but i wanted to share our experience with you nonetheless. the 2-person and 4-person options from blue apron are totally different and the 4-person options are a bit more family-friendly than the 2-person, but i didn’t think we needed 4 servings, so we chose the 2-person option which was plenty of food for us (we sometimes even had leftovers) but that was mostly because the happy little dude refused to eat pretty much any of it. some of it was too spicy for him (the posole the first week was almost too spicy for me! ), some he just didn’t like because it was new. he did eat some of the raw golden beet and the happy little baby ate raw tomatillos with gusto, but the actual menu items? not a big hit with either kid. and to be honest? only about a notch or two above “meh” most nights for mr. happy stuff and myself. this could be because i had high expectations and these didn’t jump up that high. it could be because of some operator error (the fried fish for the fish tacos lost all of its breading every time i flipped a piece in the pan). but i thought it might be worth looking to see if there were other similar services to choose from. i found two — hello fresh and home chef. looking at their menus, hello fresh looks very similar to blue apron and home chef looked… more home-y? a little more like food my whole family could get excited about. so we signed up to try them out. so far, we’ve gotten one box (and i’ve got two more on the way). first of all, home chef provides each user with 10 menu options each week (regardless of whether you’re ordering 2 portions or 4) plus a “breakfast” option (which we ate for dinner), a smoothie option and a fresh fruit option (the last two are half the price of the meals). you can choose as many or as few meals as you want, but if you want free shipping, you need to order a minimum of 3 (but i do appreciate the option to order more if i want to!). you can also set up your default order to include criteria like “low-carb” or “low-calorie.” home chef also offers more flexibility in delivery days — you can choose from 4 days of the week, whereas blue apron i think gave 2 options? of the foods we’ve tried so far, one of the three was happily eaten by both kids (roasted pork tenderloin and soba noodle bowl! ), one would have been eaten happily (i think?) if pizza wasn’t the other option that night (we were dining with friends and i chose to share my cajun blackened chicken (not super spicy, hooray!) with a cucumber, tomato and feta salad with my host and she provided pizza for all the kids), and the other was… disappointing (i really think it might be me and my frying technique). overall, with both companies i found myself frying a lot more things in a pan than i usually do (whether that was fried chicken or steaks or burgers or kibbeh), eating way more whole pieces of meat than i normally do (we’re usually more of a ground beef or shredded chicken sort of family) and… a lot less shredded cheese, come to think of it. we’ve all been asked to try foods we don’t think we like (chicken mole for me. nope, still don’t like it!) and we’ve discovered a few new foods that we do like. it’s a bit pricey for us to commit to doing this year-round, but i can see wanting to order a box or two to get us through particularly busy points in the year (like, for instance, the start of summer reading club at the library?). the packaging and branding for blue apron is a little more polished (if that matters to you) and they feature small farmers and artisan ingredient producers whenever possible. home chef includes the name & photo (and sometimes blog address) of the chefs that created each meal. my only complaint about home chef so far was that there was some confusion with one of their recipes (what they sent and what the recipe called for didn’t quite match up). both boxes stayed plenty cold all day while i was at work the days they were delivered. depending on the menu for any given week, i would still happily order from either of them. both companies have given me 3 invitations that would allow you, dear reader to get some free food, so i thought i’d do a quick giveaway to reward you for reading all the way to the bottom of this long post. actually, i’m hoping to do several giveaways in the next week or so to celebrate my 10-year anniversary of my first blog post here on happy stuff! if you’re interested in trying out free food from either of these two services, leave me a comment below stating which company you’d prefer to try and which of the “categories” in the side column is your favorite kind of post to read on happy stuff. deadline to enter is monday, june 22, 2015 at midnight. This entry was posted in reviews, yum. Bookmark the permalink. So ya think they’d deliver to Isom, KY? Glad you’ve been able to try them out and I hope you’ll continue to get an assist from them when you need it. We’re here in Decorah, IA. Does blue apron deliver to 52101? My child only eats beige and white (though she does eat wasabi peas (her only green vegetable, if one counts wasabi embalming)). I’ve decided this must be evolutionary because it’s gone on for 2 years. Nevertheless, mommy still likes variety. I’m interested in trying home chef! I wish I’d known about this 3 months ago… Could’ve helped a lot during my internship. Hummm… you have me intrigued ;-) You know my family, my kids are a bit adventurous with food and we can supplement with stuff from Farmer’s Market, so you choose which food offer to share with us. Might be a life saver during the school year but happy to be able to try it during summer. I love your adventurous spirit and am so happy you share your findings with the rest of us.